(Kansas City, MO – Jan. 2, 2017) Many RideKC routes change this month, including 11 Northeast-Westside and several routes between Johnson County and downtown Kansas City, Missouri. RideKC 11 will expand service to the University of Kansas Medical Center in Kansas City, Kan. on weekdays in a pilot program. The expansion of 11 Northeast-Westside will offer more access to healthcare and thousands of jobs from the Northeast, Westside and downtown. On weekdays, the service will run every 30 minutes, and once an hour between 7 p.m. and midnight. The change is effective Monday, Jan. 8. Both the Smart Moves regional study and the Rosedale Master Plan identified the importance of access to the KU Medical Center and KU Hospital. Now, a one-seat ride is available to more people in the region. Other routes serving the area include 39 39th Street, 405 Nall and 107 7th Street-Parallel. 404 Metcalf-Downtown, 435 JOCO Downtown Midday, 519 Olathe Express, 563 Shawnee Express, 569 South OP Express, and 595 Gardner-OP Express are changing their routes slightly to provide better connections to the Federal Reserve. This change was effective Tuesday, Jan. 2. Two routes serving western Wyandotte County are changing to provide better access to jobs, effective Jan. 2. 115 Kansas Avenue provides more direct service to Wild Woody’s supermarket on South 65th Street and Kaw Drive. The route also include service to Cambridge Apartments and to the residential area just west of the Amazon Fulfillment center. 116 West Parallel provides more direct service to the Village West East development with additional services to Dairy Farmers of America and Frontier Justice. 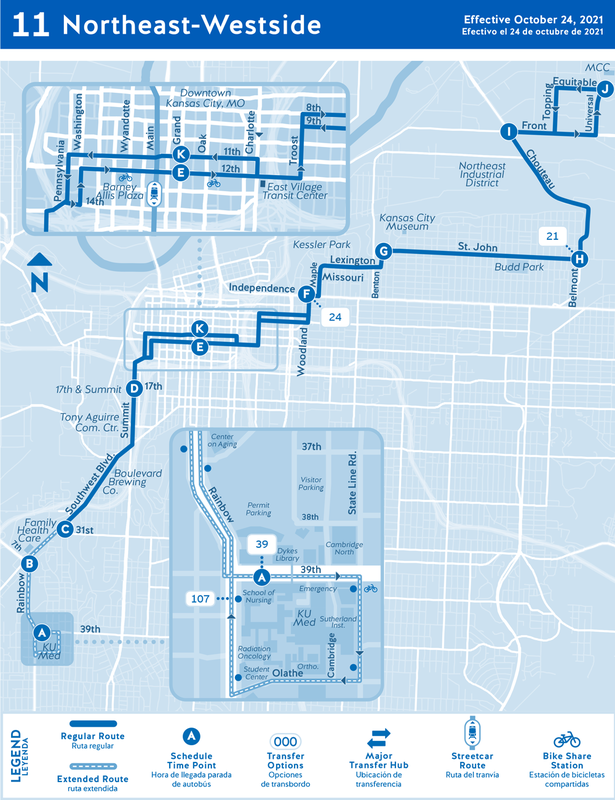 24 Independence will change its downtown route due to lane changes on Grand. Weekday, Saturday and Sunday schedules will also be adjusted by several minutes to improve on-time performance. 28 Blue Ridge, 57 Wornall and 75 75th Street have minor schedule changes to help buses stay on schedule. 75 will change its stop at 3-Trails Transit Center and travel into the transit center. New schedules are available online and on board buses. For help planning a trip on an affected route, call the Regional Call Center weekdays between 6 a.m. and 7 p.m. at 816.221.0660.